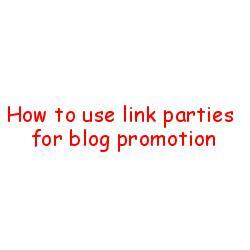 How to use link parties for blog promotion? - Reviews and Responses. Home › internetpromotion › How to use link parties for blog promotion? How to use link parties for blog promotion? Link parties for blog promotion. Link parties are also known as blog hops in the Internet marketing world. In case, you want to compile a resources list for blog promotion through link parties, I suggest you use both the keywords to search. Those who have started blogging in the mid-2000s must be aware of Blog Carnivals. 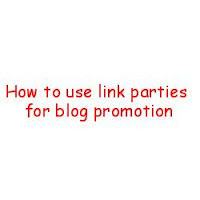 A link party is similar to blog carnivals. 1. Link Parties are usually hosted on the blog that has started the party. 2. Invariably, link parties are open to specific topics that include food and recipes, beauty and fashion, arts and crafts and so on. Oh yes, there are link parties on Pinterest profiles, Instagram pages, Tumbler blogs too. They are fun to join. They are excellent places to expand your bloggers' network and get instant exposure to your blog posts. 3. To join a link party, you must read the rules laid down by the party host and comply with them. Invariably, the host asks that you place the link party badge or button on your site or in a post. Then, all you have to do is add your blog post and your name to become a participant to the blog hop. 4. It is an unwritten rule that you must visit others’ links, make a comment or share it on social media. You just can’t drop your blog post link and get out. After all, you have joined a link party that is on a specific topic of your interest. You should genuinely show interest in other contribution. If you don’t have time and patience to that, stay from link parties. 5. If you want to host a link party on your blog, there are a few linky tools that will help you to create a link party badge/button that you ask your party attendees to place on their blogs for instant visibility. 6. 'Blog hops' typically lasts one day although there are exceptions. 7. Blog hops are a great way to get backlinks from similar niche blogs. Link parties are usually thrown open to all on specific days of the week and they are called after that. Example, Wednesday link parties. Where to find link parties? Of course, there are directories to link parties and blog hops. Here are a few of them. I was searching for beauty link parties and was successful in compiling a list. Just as I was rounding off my link party list compiling, I stumbled on to this short list below. Go and have a party, bloggers! Note: Some of the links above might have vanished off the cyberspace as this list must quite old.